Pictures Of Dentures | Denture Photos Showing Different Types! This series of pictures of dentures is meant to illustrate the different types of denture available today. It is not an exhaustive list of denture photos, but I hope it gives you some information for those of you wondering what a denture looks like, or what the different types of denture look like. Full dentures. These are pictures of dentures where there are no natural teeth left, and the denture is what we call a "full" denture or sometimes a "complete" denture. You can see that as well as just replacing the teeth, there is also gum-colored pink acrylic that sits over the gums, and holds the teeth in place. 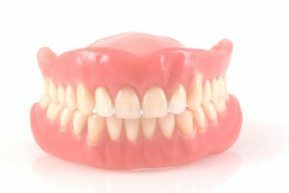 When it comes to looking after your dentures, I strongly recommend that you take a look at Best Denture Products. This gum-colored pink acrylic also replaces some of the gum tissue where the gum has shrunk. This helps to build up a " fallen in "appearance, by pushing out the lips and cheeks into their normal positions. Partial dentures. 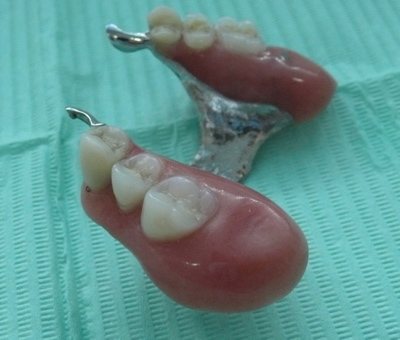 These are dentures that replace somemissing teeth, where you still have natural teeth. 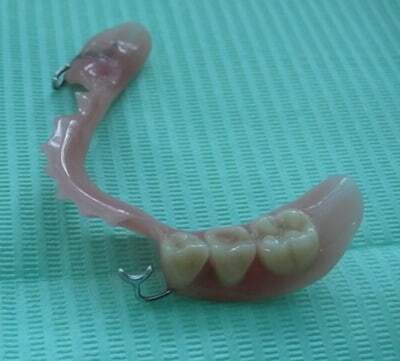 Partial dentures are usually held in place by small clips or clasps. These look like little bits of wire that wrap around a natural tooth, gripping it firmly. People sometimes ask me if these little wires damage the natural tooth. The answer is "NO". Not on their own. BUT they can trap plaque if they are not cleaned thoroughly, which can cause gum disease and cavities. 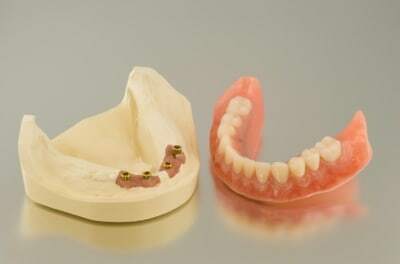 Above are acrylic-based denture photos. 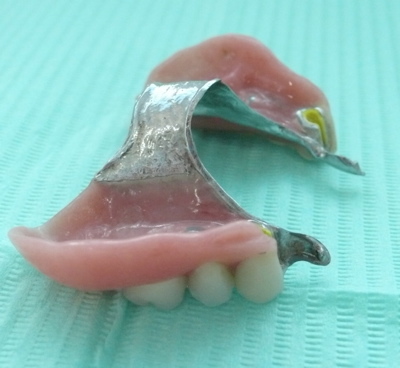 Below is the cast chrome cobalt framework for a partial denture without any teeth on it yet. 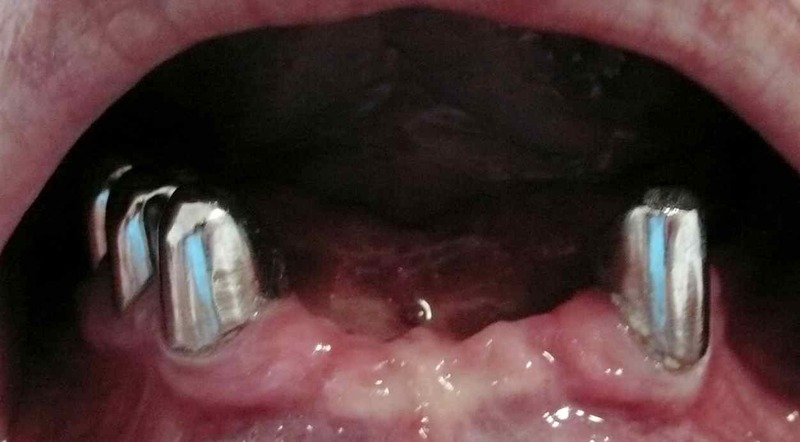 This is a trial stage, for checking, before the teeth are added. 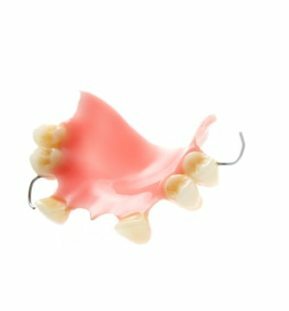 A chrome cobalt frame can be made much thinner than an acrylic denture base and it is stronger too. 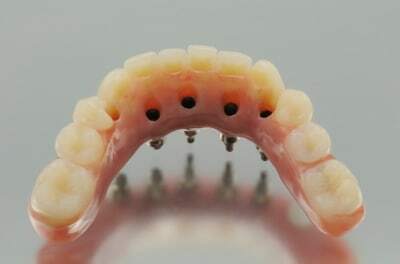 The next pictures of dentures show a very sophisticated partial denture, which has small hidden attachments to hold it in place, rather than clasps or wires. 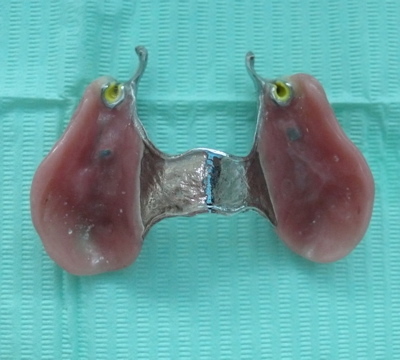 The attachments are the little yellow tubes visible on the left and right of the denture. The little wings next to the yellow attachments fit very precisely and snugly around crowns ("caps") on the natural teeth. This arrangement makes the denture as small and neat as it is possible to make it. 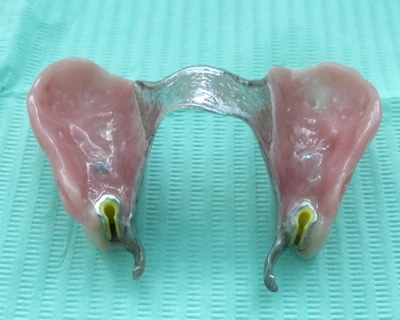 Below are some pictures of implant-supported dentures. The first picture shows the dental laboratory plaster model with replicas of the implants in the front of a lower jaw. 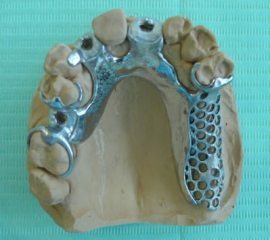 The denture will fit over the jaw bone and over the implants, and be held in place by the implants. The second picture shows the inner side of the denture. 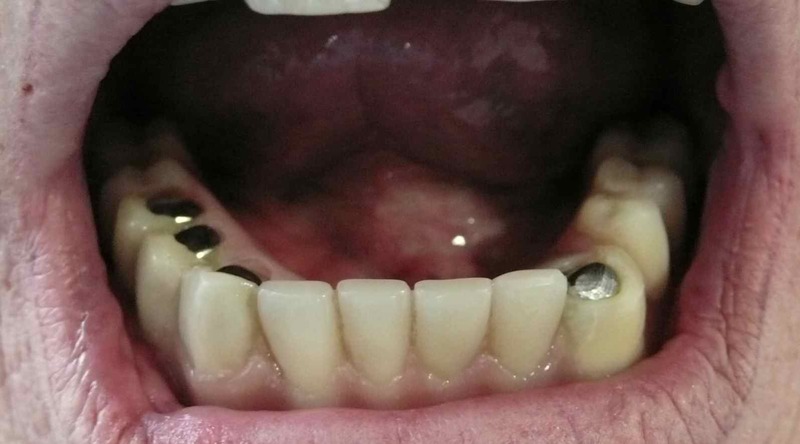 Tiny screws will be fitted inside the holes, and anchor the denture to the implants. 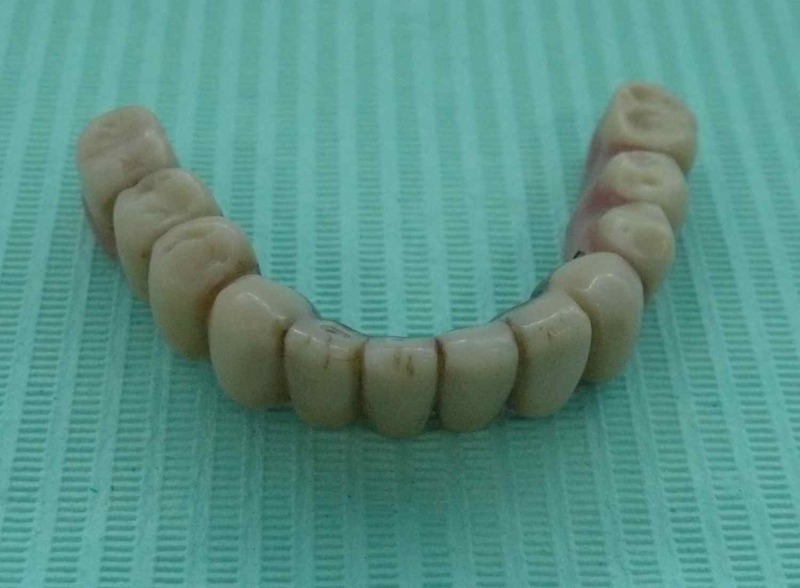 You can read more about this type of denture at the dental implant dentures page. Finally, here are some photos of a Telescope Denture. 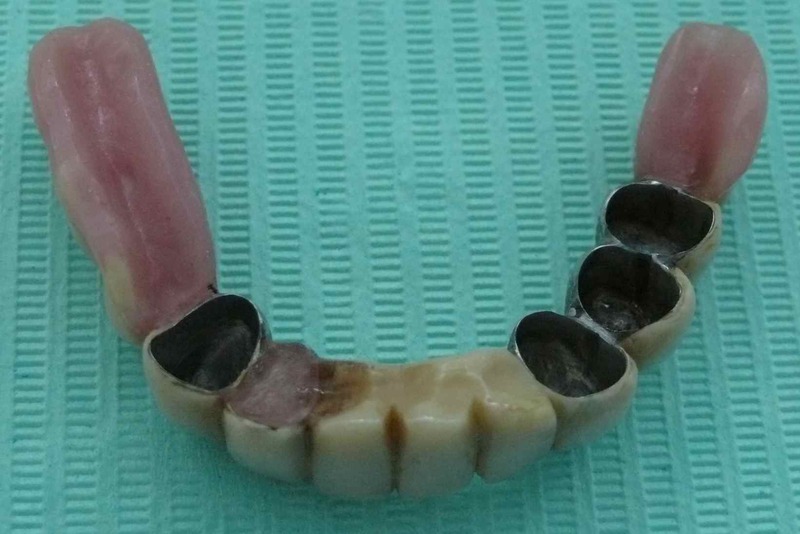 This is a denture that looks similar to a normal full denture from the outside, but underneath, on the inside, there are several teeth that are hollowed out and lined with a very slim metal sleeve. These metal sleeves are called the "outer telescopes". 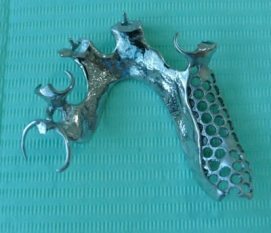 These fit over the "inner telescopes" which are fitted to 2 to 4 remaining teeth in the mouth. Because the inner telescopes are very precisely milled to match the inside surface of the outer telescopes, they fit very snugly and hold the denture very securely in place. You've probably spotted that the denture in the final picture is not exactly the same as the telescope denture in the first 2 pictures. It is the same patient, but the final picture is of a temporary version that I am trialling with this patient. I used this photo because the tips of the inner telescopes are visible through the top of the denture, hopefully making the concept a little clearer to understand! 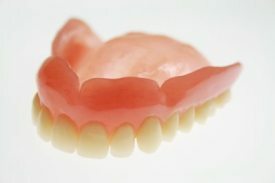 I hope this review of pictures of dentures gives you some idea of the different designs that are available, depending on your individual circumstances.